We Sent These Kids To Camp! Now To Ramblewild! I’m back from our one day retreat to Williamstown, Mass, we had a blast, but enough of that, it’s old news. I am on fire to get back to doing some good, I missed it. We have already done a lot of good this summer, a month to go. 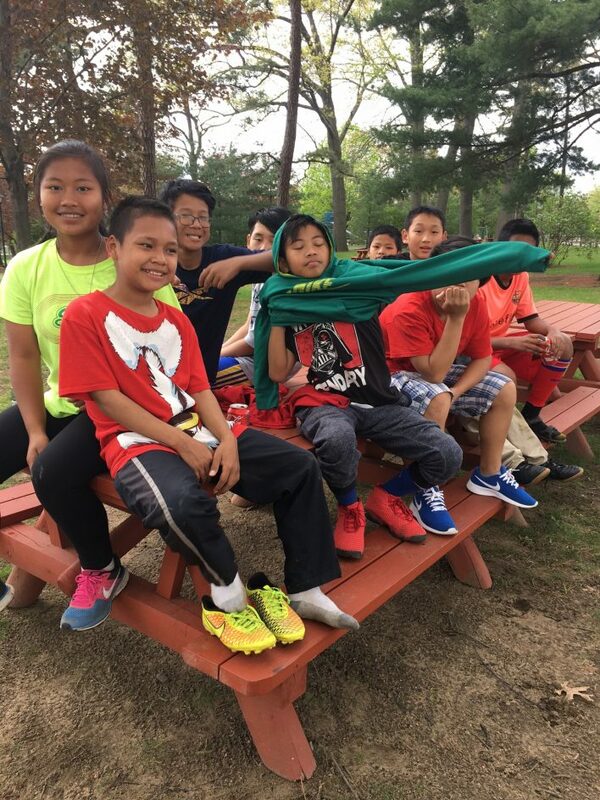 This summer, the Army Of Good made it possible for eight refugee children to go to summer, a desperately needed opportunity for the to get out of the city, be in the country, swim and relax. Their lives have been difficult, from birth to junior high school. The summer camp experience has been wonderful for them, and for their families. The alternative activities on Albany streets are not appealing. We paid some fees, bought shoes, deodorant, soap, sheets and towels, jackets and shorts, insect and tick repellent and sun screen, along with the other things that were required for them to go, and that their parents could not afford. Without your help, they could not have gone. This is a stellar example of small acts of great kindness, with these children, a little money goes a very long way. More and more, I am moving in this work to small and bounded opportunities to change lives rather than massive investments of thousands of dollars, which I don’t have and don’t want to ask for. Staying small and consistent. We don’t have a lot of money, but what we do have counts. Ali and I call it focused good. I’d like to get right back in the saddle by asking for some help to get kids from the soccer team – as many as we can afford – to Ramblewild, a tree-to-free forest adventure in the Berkshires that was designed to give kids like the refugee children confidence, and foster team building, friendship and life outdoors. Ramblewild has all kinds of outdoor adventures and hikes and treks, but the aerial park takes place 45 feet above the ground. It’s a supervised three-and-a-half hour program where the kids climb up to wooden walks high up in the forest, wearing helmets and attached to zip lines. Up in the forest canopy, they walk on bridges, swing on rope swings, climb ladders, crawl on cargo nets, even confront a Nintendo warrior. It’s an exciting place with a serious and thoughtful ethic. I really like the feel of it and hope the kids can go more than once and take part in some of other team building and environmental activities. It’s very close to Albany. This will have special meaning for many of these children, most grew up in heavily wooded forests in Asia, and will feel at home. The owner of the park is a forest foundation – Feronia Forests – that promotes understanding of trees, forests and the environment. I’ve been researching other trips for the soccer team – the Statue of Liberty in New York, and the New England Aquarium in Boston. My hopes are to send as many as we can to Ramblewild, and the Aquarium, and visit New York City at a later date. The Aquarium is important, educational and fascinating (there is a giant octopus exhibit there). We’ll get there. Ramblewild has become my number one priority for the summer, it is just the perfect these for these children now, on top of the other, shorter and easier (and cheaper) activities we’ve planned for them this summer. Most of these kids have been out of school this summer. Most have single parents, and there is no money and no activities apart from Ali and his heroic red van. So I need some help, but not a lot of help. The aerial adventure costs $69 person, and I’m figuring on a total of 12 people going, including Ali, who can supervise and translate when necessary. I might join them, but i I do, I’ll pay for myself. I also want to contribute $400 of my money to this trip. So the tickets will cost $759 – $400 which is $359 for the tickets. Ramblewild is just an hour or so from Albany, and the only other expense will be food. I’ve found a nearby country store that will bring lunch to the kids at Ramblewild, it will cost about $12 a person, so that will be about $150. I have enough money in the refugee fund to pay for that, and I just got a large donation that will help, I’m splitting it between the refugees and the Mansion residents (they are going on a big boat ride in Sept). There are also gas and other incidentals for the Ramblewild trip – somebody may need shoes or sunscreen and tick repellent. So if I can raise an additional $400 to $500, I’ll be set and will go ahead and order the tickets for a day in late August. If anyone can help and wants to help, that would be great. You can send a contribution to The Gus Fund, c/o Jon Katz, Post Office Box 205, Cambridge, N.Y., 12816 or via Paypal, jon@bedlamfarm.com. And thanks. It’s better to do good that fight about it.